What does The Church of Jesus Christ of Latter-day Saints religion teach about prayer? Members of the Church believe that prayer is communication between us and God, our Heavenly Father. Heavenly Father wants us to pray to Him every day, both individually and with our families. Latter-day Saints (commonly known as the Mormons) believe that God wants us to “pray to Him and no one else” (“Prayer,” Gospel Topics, topics.ChurchofJesusChrist.org). Their religion teaches, as does the Bible, that when Jesus Christ was on the earth, He explained that we should pray to Heavenly Father in Jesus’s name (see John 16:23). For the Church, prayer is both a commandment from God and an opportunity to communicate personally with Him. To show our respect and love for God when we pray, we kneel, bow our heads, and close our eyes. Followers in the Church believe that when we pray, we should be mindful that we are speaking to our Father in Heaven and use loving, respectful language. The Church of Jesus Christ of Latter-day Saints teaches that there is power in praying aloud, and the scriptures encourage us to frequently pray in private so that we can express our true feelings to God (see Matthew 6:6–7; Alma 34:17–27). However, we can pray to God anytime and anywhere. 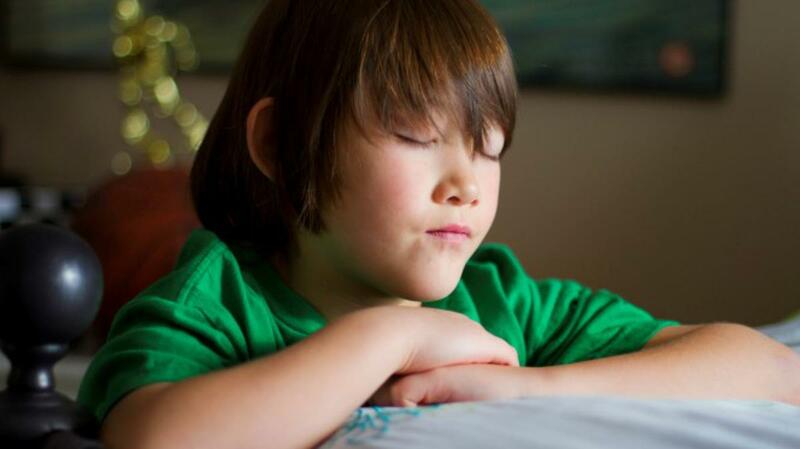 Latter-day Saint beliefs include the teaching that even a thought can be a prayer if it is directed toward God (see Guide to the Scriptures, “Prayer,” scriptures.ChurchofJesusChrist.org). Members of the Church of Jesus Christ of Latter-day Saintss believe that when we pray, we should express our gratitude to Heavenly Father for our many blessings. As one Church leader remarked, “The most meaningful and spiritual prayers I have experienced contained many expressions of thanks and few, if any, requests” (David A. Bednar, “Pray Always,” Ensign or Liahona, Nov. 2008, 42). The Church beliefs include the teaching that all that we have comes from God and that even during our most difficult challenges, we can still thank Him for our blessings. Their religion teaches that Heavenly Father wants us to ask Him for things that we need when we pray. Jesus Christ taught, “Ask, and it shall be given you; seek, and ye shall find; knock, and it shall be opened unto you: For every one that asketh receiveth; and he that seeketh findeth; and to him that knocketh it shall be opened” (Matthew 7:7–8). Members of The Church of Jesus Christ of Latter-day Saints believe that when we pray, we can ask Heavenly Father to aid us with our physical, emotional, and spiritual needs, and any other needs we may have. Members of the Church also believe that as our loving Father, God desires to help us and will grant every blessing that is expedient to us. However, when we ask Heavenly Father for blessings, we should pray that His will be done and do everything in our power to be worthy to receive the blessings we ask for. What blessings come from prayer? The Church members believe that prayer brings many blessings. The Church of Jesus Christ of Latter-day Saints teaches that when we pray, we can feel God’s love for us. We feel gratitude as we ponder the many blessings that are already in our lives. We feel a greater sense of happiness and peace as we strive to align our will with God’s will for our lives. We are blessed with greater patience and faith. We can feel the influence of the Holy Spirit guiding and directing us. When we pray, God opens the windows of heaven and grants us blessings that He was already willing to give, and that we only needed to ask to receive. We can also help bless others’ lives as we express sincere petitions to God for their welfare. To learn more about The Church of Jesus Christ of Latter-day Saints and what Church members believe about prayer, visit ChurchofJesusChrist.org.